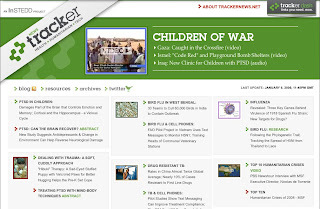 Over the past few months, InSTEDD has quietly launched a new website that focuses on humanitarian and health technology: www.TrackerNews.net. It is ready now for a little noise! As we've worked on research & development over the past year, we've found ourselves at once delighted and daunted by the amount of interesting and useful information on the web – most of which isn’t available through news feeds. We decided to create an aggregator that would add a layer of context and go beyond RSS feeds, weaving together stories about humanitarian work, science, technology and “one health” (human, animal, plant and planetary – it is all of a piece). 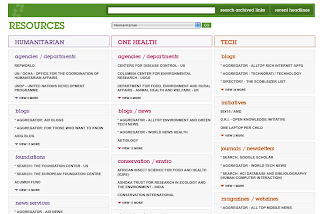 We take to heart science fiction author Robert Heinlein’s words of 40 years ago: “Specialization is for insects.” We understand that very few people have much time to read outside of their specialties, but we think we have created TrackerNews as a resource that delivers a much-needed breadth of perspective. We hope it becomes a place where serendipity is a regular feature; a place where specialists routinely discover relevant work in other fields, and where "need" and "know-how" intersect. Science journalist Janet Ginsburg took the lead developing the site and now serves as its editor and blogger (http://trackerblog.instedd.org). Janet designed TrackerNews with intelligence, experience, and a contact list that's terrific at helping us assess the world’s humanitarian, technical, medical, and scientific developments. TrackerNews has a few twists. For example, headlines are not organized by topic, nor is there a standard navigation bar. Rather, a story on a single topic (whether news articles, research papers, blog posts, websites, book reviews, e-books, software downloads - print, audio, video) is grouped with background material in a single silver box to offer context and explain significance. This makes for a somewhat eclectic mix on any given day, but it’s designed to provide readers, especially those who tend to select themselves into “silos” of expertise, with a multi-disciplinary perspective. Take a look at this Flickr slide show to get a sense of the range of subjects covered on TrackerNews: Slide examples. I think you'll agree we're covering some fascinating stuff, and that much of it you've never seen elsewhere. Although groups of links tend to be driven by news events, in general TrackerNews is not for reporting “this-just-in!” stories. Nor are stories on Tracker ranked by popularity, which we think tends to create a self-reinforcing skew. Links are selected for their bearing on a particular subject and for their utility. Academic papers are sometimes included in groupings to make it easier for interested readers to see original research and find contact information. Scroll down “below the fold” for the Resources section. This is, and always will be, work-in-progress, but even at this early date, there are hundreds of links. Whenever we find an aggregator that goes into more depth on a topic, we link to it and give a prominent position in the category. The mission of our TrackerNews site is to connect you to the information you need. We also have a “Custom Tracker” tool in development. Here is a link to a rough sketch. (Custom Tracker example) Basically, it is a DIY site map for the collective knowledge of a group or an event. The back end user interface is both WYSIWYG and drag’n’drop (think iGoogle homepage edits). I'm really pleased that TrackerNews, even in this very early version we’ll call v0.1, has already generated some positive discussion on the value of the crossover dimension. People working emerging infectious disease surveillance are commenting on rapid disease detection technologies developed by electrical engineers. Human rights advocates are looking at communications tools developed to combat wildlife smuggling. The cross-pollination is working. As most people reading this know, at InSTEDD we're deeply interested in improving collaboration and information-sharing through free and open source tools that we design with close input from our users. We apply that bedrock approach in everything we do. Please take a look at www.TrackerNews.net and let us know what you think. Send feedback to Janet at editor@trackernews.net. On behalf of everyone at InSTEDD, we look forward to hearing your thoughts.